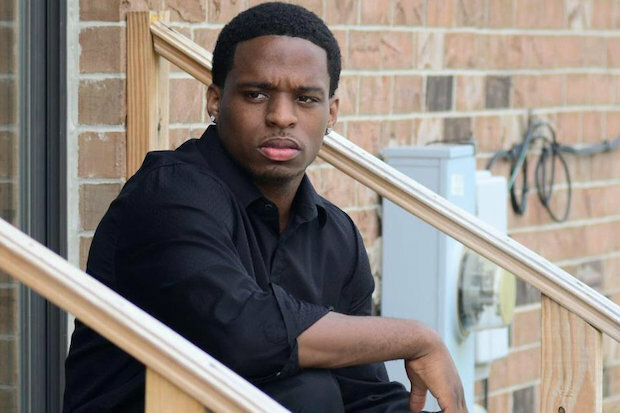 UPTOWN — From the time he was born at the bottom of a staircase, Bobby Dixon's life has been filled with challenges. His mother was in and out of prison for dealing drugs during his childhood, which saw him live with relatives in Uptown, Rogers Park, Cabrini-Green and Humboldt Park. When he was 10, his 13-year-old brother, Brian, was fatally shot in the back. Dixon remembers Brian wearing a blue baseball jersey inside a coffin at the funeral, while his mom, Lawanda, watched in shackles surrounded by correctional officers. Dixon himself went to Cook County Boot Camp when he was 18 for drug-dealing — what he called the "family business" that had sent his mom, dad and three older brothers to prison. 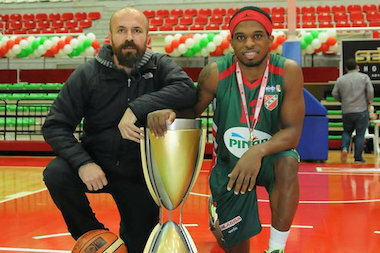 Chicago native Bobby Dixon (r.) led his team to the Turkish Cup, the equivalent of the NBA Championship, in February. "You're the youngest of five, and you see that on a daily basis, and what else are you going to do?" Dixon asked. "Of course, I stuck my hand in there and got burned." But Dixon was saved by basketball and what he and others called a "relentless" will to succeed. He is 31 now, and, since 2006, the point guard has played hoops overseas for teams in France, Poland, Italy, and, for the last two years, Pınar Karsıyaka of the Turkish Basketball League. In February, Dixon led Pinar to its first-ever Turkish Cup tournament victory, considered the NBA Finals of Turkish basketball, and he just wrapped up guiding the club to its postseason semifinal round in May. Dixon returned to Chicago last week, where he'll spend the next few months with his fiancee, Tangela Oliver, and their two daughters: Heaven, 8; and Angel, 4. He'll also be hanging out with his mother, who has been drug-free for 16 years and resides in the small Roseland home he bought for her in 2011. "He forgave me for all my wrongdoings," Lawanda Dixon said. "I'm thankful today. I know God did this for me and for him." On April 10, 1983, Lawanda Dixon was returning from a laundromat to her three-flat at Thorndale and Winthrop when her water broke. "I tried to make it upstairs, but I couldn't make it," she said. With the help of his father, Johnny Newell, Bobby Dixon was born at the bottom of the stairs. "It was painful. It was painful. It was painful," Lawanda Dixon said. Lawanda fully admits to using and dealing drugs. She smoked heroin and sometimes crack cocaine for all of Bobby's childhood. When Brian was killed, she had been in prison for manufacturing drugs. After his death, she said she "called on the Lord to ask to get my life in order." "I used drugs because I wanted to be happy, and I never had anyone tell me they loved me," she said. Bobby described his upbringing the same way — without any affection directed his way. He had been an emerging hoops star at Sullivan High School when he was arrested for dealing drugs before his senior year. He received a GED while serving time at the Cook County Boot Camp, and the experience behind a barbed-wire fence changed him. After leaving the camp, he lived on Howard Street and commuted three hours each way on the Red Line and then took a bus to get to the UPS sorting facility in suburban Hodgkins, where he was a package handler for the 4 a.m. to 10 a.m. shift. He'd come home "like a zombie," sleep for a few hours, then head to either Loyola Beach or Montrose Beach for brutal, hourslong workouts captained by Bryan McKinney. McKinney had met Dixon when he was the athletic director of the McCormick Boys & Girls Club. He witnessed Dixon owning the basketball court, but he also saw a kid without discipline or trust for any adult. It took months for McKinney to gain Dixon's acceptance, but their bond was cemented in the summer sun on the sand. Dixon, wearing a weight vest and a harness, would pull a stationary McKinney a few feet through the beach until he was exhausted, then run a few miles each way solo. "They broke the mold when they made Bobby. His will and his determination to succeed was unbelievable," said McKinney, who now heads the "No Books No Ball Basketball Program," which teaches young players sportsmanship and provides academic and athletic support. "With the workouts, I just wanted him to learn and think for himself," McKinney, of Auburn Gresham, added. "I wanted him to be tough mentally." Said Dixon: "Those workouts put me above everyone else. My will and my drive was better than anybody else's. The way I grew up — being a project kid — after that, I had it in my head that nobody was going to stop me." At the end of the summer of 2002, Dixon still hadn't found a place to play college hoops. He and McKinney said he had a few looks from junior colleges, but coaches were hesitant to take a chance with someone who had such a checkered past. McKinney contacted Kankakee Community College — he knew some of the coaches on the staff — and he shuttled Dixon to the campus gym. Dixon and McKinney said Dixon's performance was poor that day — a Friday — but KCC coaches offered him a partial scholarship anyway. Dixon verbally committed Saturday and packed a few things that evening. McKinney drove him back on Sunday and school began Monday. "It was a blessing and the start I was looking for," Dixon said. "Ever since then, every opportunity I've gotten, I've got to make the most of it." Dixon didn't see the floor his first few games at KCC. The first time he came off the bench, he scored 27 points. The next game, again as a reserve, he netted 18. He started the rest of his two-year career there and graduated with an associate's degree. His journey for the next two years would take him to Troy (Ala.) University, a Division I program. He averaged 16.3 points per game over 59 games and was named to the All-Sun Belt Conference first team in 2005-06. "I never stopped playing hungry, always with a chip on my shoulder," said Dixon, who graduated from Troy with a bachelor's degree in health services. "I always played like I had something to prove." As good as his statistics were, Dixon also was a realist. He understood, at 5 feet, 10 inches, his chances of making an NBA roster were almost nonexistent. "There's only a limited amount of spots in the NBA, and you have to be really unbelievable to stay there," Dixon said. "You have to find your lane and what you're good at and stick with it." For Dixon, that route has taken him to Europe, where he's fared well. He led the Polish League in assists in 2007-08 and has been a consistent starter throughout his time across the pond. He was named the MVP of the Turkish Cup in February after scoring 19 points with six assists and five rebounds in the finals. Over the next month, Dixon said he'll decide whether to return to Turkey or sign with another European club. Dixon said he has at least another five or six good basketball years left in him. But he's already laying the foundation for his future. He's preparing to launch his Chicago-based "Lionheart" organization, which will create mentoring programs, lead community projects and create a clothing line. "I want to be in a position to help change lives," Dixon said. "I want to stop some of the these kids in the inner city from going down the same path I went through." He's also readying to host the fourth edition of Bobby Dixon Basketball Skills Camp at Uplift Community High School in Uptown during the first week of August. The free camp is for players 10-17 years old. The warm months also provide Dixon a chance to see his fiancee — whom he's known since they were students at Goudy Elementary — and daughters, who live year-round in south suburban Country Club Hills. His most treasured time is with Heaven and Angel, knowing that he's administering the type of care he never received as a child. "That cycle was going to be broken by me," Dixon said. "I remember the feeling of not having my mom and dad around. All I wanted to be was a kid, but I had to grow up faster than I wanted to." He and Lawanda are on terrific terms. He surprised her with the home purchase while he was competing in France. Oliver drove Lawanda to a Realtor's office, told her to "sign the papers for your house," and then put Bobby on the phone. "I couldn't do nothing but cry, cry, cry, cry," Lawanda Dixon said. Dixon has also bought his mother new living room and dining room sets. Soon, he's supposed to buy her a car — "nothing special," Lawanda said, "just something that gets me from here to there." "My life wasn't that easy, and my mom didn't make it that easy, but my mom's doing good now," Dixon said. "She deserves it. You only get one mom, and now that she's clean, I've got to help her out as much as I can. If you're in a position to help your mom, you help your mom." Last week, Dixon picked up a new, bright-white Bentley Continental GT at the city's Gold Coast dealership. The nearly $200,000 ride is the one luxurious purchase he allowed himself to make with his basketball bucks. "I still don't really believe I have it," Dixon said. "It's kind of surreal. That was always my dream car." The Bentley is a material representation of his life's achievements, but it pales in comparison to the rebuilt relationship with his mom and the unending love for his wife and kids. And Dixon said each day is an opportunity to appreciate what he has — and the monumental hurdles he has overcome. "C'mon man, most people don't make it out of those situations," Dixon said. "It's like one in a million, one in a billion."